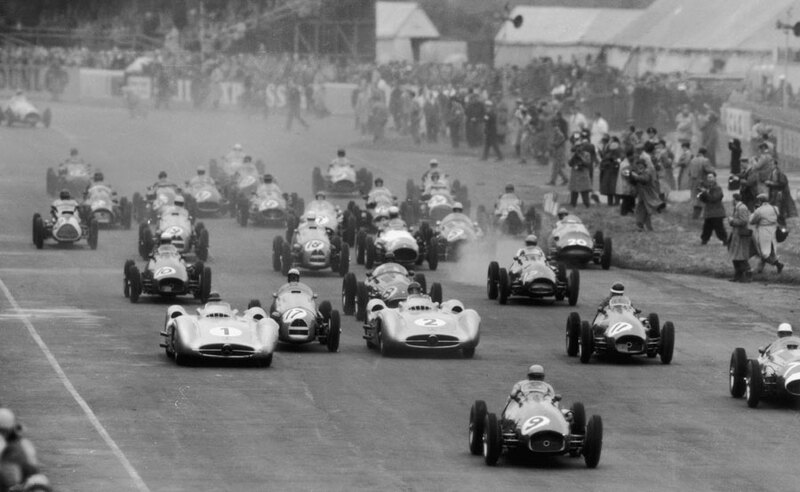 José Froilán González added spice to the championship season with victory at the British Grand Prix as Juan Manuel Fangio's Mercedes showed its vulnerability with a series of mechanical glitches . It was a welcome boost for the Italian manufacturers after being completely outclassed at Reims a fortnight earlier. In qualifying on pole, Fangio upset the Mercedes team by using the empty oil drums which lined the corners to find the best racing line, repeatedly clipping them and in so doing covering the W196 in dents. He told an angry Alfred Neubauer he found the Mercedes handling unpredictable and was poorly sighted by the all-enveloping bodywork. In intermittent drizzle the 90,000 Silverstone crowd were heartened by the sight of Mike Hawthorn and Stirling Moss on the front row. As Gonzalez and Fangio dueled for the lead, Moss and Hawthorn engaged in a tussle for third, which Moss eventually won only and then in turn moving past Fangio. But ten laps from the end Moss' rear axle failed, and with Fangio having to use all his guile and experience to keep his Mercedes going, Gonzalez cruised to victory. Fangio came fourth,Trintignant and Mieres took fifth and sixth as the top six included four Argentine drivers. It was also a bad day for the race time keepers, who awarded the fastest lap equally to seven drivers. As fastest lap was a worth point, they were all awarded one seventh of a point. Vanwall's debut ended in an early retirement with engine trouble and it was another two years before the team became F1 regulars. And Ron Flockhurst had a lucky escape when, shortly after taking over Prince Bira's Maserati, he rolled it three times and was trapped under the wreckage before being freed by spectators. Moss gained some solace late in the day when he won the 500cc race.